I have a confession. I love bread. Any kind of bread : White, multigrain, loaves, buns, sweet and savoury. You name it, I love it. Not good for the waist. but SO good for the tummy. haha of course, there is an abundance of bread here in aussieland. But honestly, what is better than baking your own bread? You could add anything you want into the dough, any combination! And there is something about seeing it rise and proof and punching out the air before kneading it. Therapeutic. Awesome. one of my favourite breads is no doubt garlic bread. The buttery-garlicky goodness when you bite into the bread could just put a smile on my face every single time. 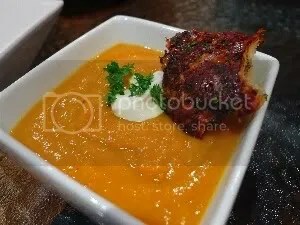 I came across this recipe while recipe searching, and I love the way it’s called. 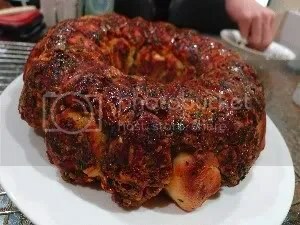 Monkey bread. Just sounds so playful. 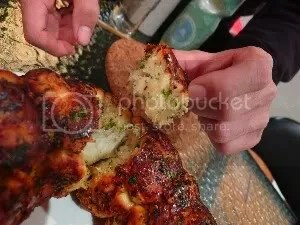 I’ve seen other recipes of monkey breads, and most of them are sweet ones with cinnamon sugar. So I was thrilled when I saw this parmesan-garlic one! I loved the whole process. 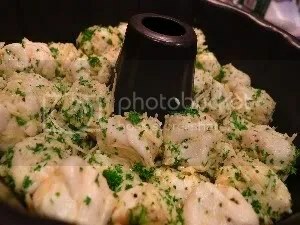 From mixing the dough, watching it rise, cutting it into smaller pieces, dipping it into butter and coating it with the parmesan garlic mixture. Doesn’t it already sound yummy?After making this, now I wanna try making the sweet one. hmm. So I urge you all to start trying making your own bread. I’ve failed a few times before, and they turned out to be really dense, but they were still yummy! Nothing beats freshly baked bread, and having the whole house smell of it! You will not only enjoy the process, but also enjoy the end product! I don’t think there is anything better than that. 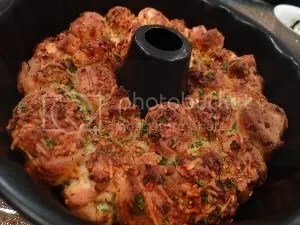 It turned out a little darker than I hoped, but it was still super yummy : warm, crusty, cheesy, buttery and garlicky! 1) In your stand mixer bowl, pour one cup warm water. Add your yeast and mix. After a minute or two, add your sugar and mix well and let stand for 5 minutes. 2) Add salt, then while mixing, gradually add your flours. Use a scraper to push the mass into the bread hooks and let it run 5-6 minutes, until a firmish dough has formed. Let the dough stand for 15 minutes, then knead another 2-3 minutes, until the dough’s “skin” is slightly shiny. 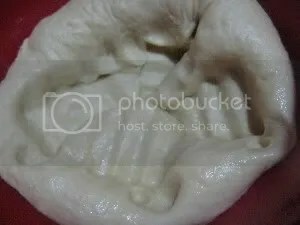 Remove to an oiled bowl, cover, and let your dough rise for an hour. 3) Mix cheese, herbs, salt and pepper in a small bowl. Melt your butter in a small saucepan and set aside. Preheat the oven to 200°C. 4) Turn out your dough onto a very lightly floured board and here comes the fun part! Pull out about a tablespoon of dough and form a ball. I ended up with about 30 pieces. Dip into the butter, then dip into the cheese mix, rubbing the mix around the entire piece. 5) Place in your buttered bundt pan. Continue until your dough has been used up, filling the pan evenly and flatly. Let the dough rise another 15-20 minutes, until about doubled. Bake for 30-35 minutes, until the top of the bread is browning.